You are here: Home / Tech News / SkyDrive premium plans, new Windows and Mac apps revealed ? SkyDrive premium plans, new Windows and Mac apps revealed ? 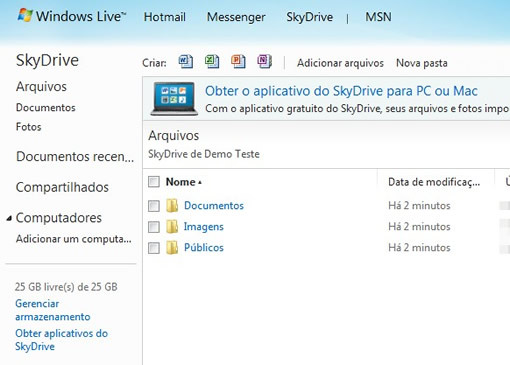 Microsoft’s SkyDrive premium plans revealed in screenshots posted by a Brazilian site Gemind, apart from the premium plans there are new apps for both Windows and Mac. SkyDrive is getting improvements recently including HTML5 upload capabilities, improved file management, and released apps for Windows phone and iOS. SkyDrive offers 25GB of free storage online, that is much higher than competitor Dropbox offering. 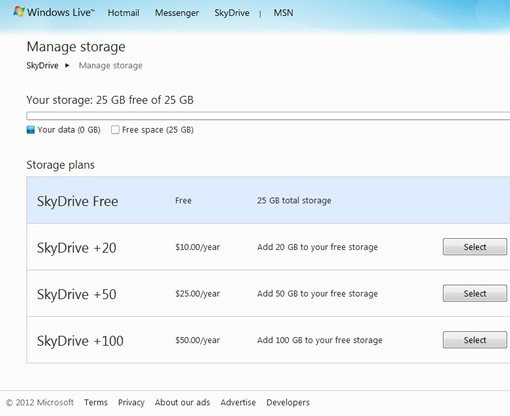 The premium plans for SkyDrive starts at $10/year for 20GB, $25/year for 50Gb and $520/year for 100GB. You can add this extra space to your existing 25GB of free space. For a comparison Dropbox offers 2GB of free storage, extra space of 50GB and 100GB for $9.99 and $19.99/month. The site also refers that this offering is not related to Live Mesh product, which is a cloud storage option from Microsoft and offers 5GB of free storage. It doesnâ€™t make sense to have two cloud storage services with different offerings so we can expect that both Live Mesh storage and SkyDrive and merge with all the love SkyDrive is getting these days from Microsoft. With the latest improvements, new pricing structure and clients for Windows and Mac, I am sure this is going to give some competition to the already popular Dropbox, and yet to be launched GDrive if the rumors are to believe. Via TNW.